Made his first run in 1972 at Oyster Bed Bridge (PE) driving a T-bucket roadster. Most renowned for his 1969 big block Camaro, a full-bodied car capable of doing wheel-stands at the starting line. In 1985 became the first Maritimer to win a NHRA event driving the Camaro at Sanair (PQ); also finished second at Reading (PA). 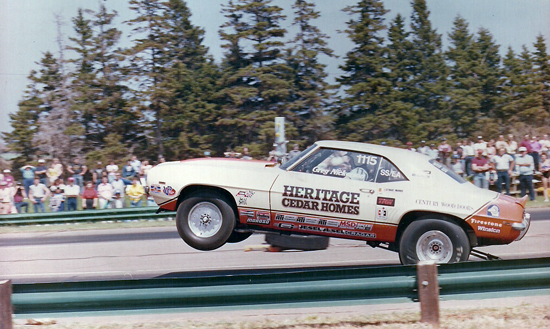 In 1986 he led a team that would re-open Maitland Dragway (NS). In 2008 he won the Stock/Superstock Maritime Drag Racing championship. In 2009 he was runner-up at Epping (NH). In 2011 he went 14 rounds undefeated to clinch the Stock/Superstock championship. Introduced to drag racing at just eight years old with his older brother Don. He still competes with a 1996 Firebird set up as an B/FIA stocker, and it consistently runs about eight-tenths under the 11.55 national index.